Water that grows farm products doesn’t stay on the farm. According to data from the California Department of Water Resources (www.waterplan.water.ca.gov) and the Food and Agriculture Organization of the United Nations (www.fao.org/nr/water/docs/WRM_FP5_waterfood.pdf), California farmers actually use LESS water than the amount required to meet all of the Golden State’s food supply needs. 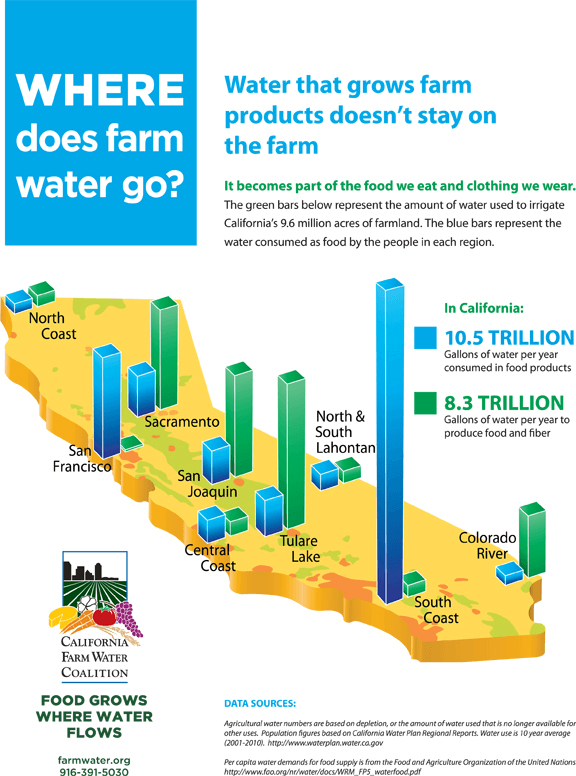 California farmers use about 8.3 trillion gallons of water on 9.6 million acres of irrigated farmland. The water required to grow all of the food consumed by California’s population is equal to about 10.5 trillion gallons. California exists in a global economy. The state’s farm production feeds more than just its own population. Farm products are imported and exported, based on consumer demand, to provide a variety of food choices throughout the year all around the world. However, if California farm production was limited to meeting only the needs of California residents it would fall short by over 26 percent. As productive as California farmers are, they simply don’t have access to enough water to grow all of the food consumed by California’s population of 38.8 million people. The food we eat here in California takes water to grow. California’s farms are among the most efficient in the world, often producing substantially more food per gallon of water than the global average. How much water does it take to grow the food we eat? Check out the breakdown for a few menu items produced using California-grown produce.